Mt. Gassan Trekking (月山トレッキング) is one of the very popular mountain in Yamagata Prefecture. Mt. Gassan is chosen as one of 100 best mountains in Japan and the main mountains of Dewa 3 sacreds. It is 1984m tall and on the top of the mountain, there is Gassan Shrine. There are many different trails for this mountain trekking. If you use the ropeway, it takes about 2 hours. The most popular route is use Hagurosan route that takes about 3 hours. This mountain is located in the middle of Yamagata Prefecture, therefore it has a great panorama view of Yamagata. The half of the year is closed under snow. The trails has many restrooms, and it is long but very easy for hikers. This video is Hagurosan route. There are parking and restroom (100 yen). 1. use local bus to Gassan Hachigome. To visit the top of the shrine, you need to join official worship at Gassan Shrine. Time: 6 hours for round trip. 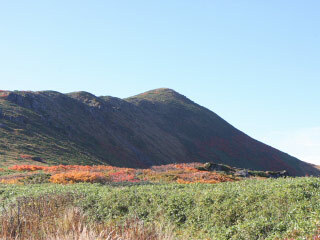 Mt.Gassan is the main mountain of Dewasanzan, the 3 sacred mountains of Yamagata. As the mountain of Shugendo, it was highly respected by many people. There are many hiking trails on this mountains and all of them has a great access. It takes about 3 hours of climing, and some course have rough route, and some of them are very easy for beginners. 5. Gassan top. Gassan Shrine, hote, restroom and rest place.